Relaxed. It was the dominant adjective describing Louis van Gaal’s performance in the Dutchman’s meet-the-press gathering on Friday. The Dutchman, whose propensity to last in the Manchester United job has been questioned more than once in the past two months, has cut an irritable figure of late. Little wonder – the veteran manager has built a career on surety of opinion, if nothing else, and doubts raised by pundits, supporters and the fourth estate do not sit easily with Van Gaal’s increasingly challenged worldview. Yet, victories over Swansea City, Sheffield United and Liverpool have added to Van Gaal’s confidence, and a renewed sense of momentum since the turn of the year. In truth, there has been little of quality from his team across those matches, but results make managers and, more specifically at Old Trafford, the ability to qualify for the Champions League is the only circle Van Gaal needs to square to survive beyond the coming summer. Then, perhaps, will come the opportunity to start again and reinvent the side in a more attacking vein. Or not as Van Gaal’s will decrees. In the interim Van Gaal’s approach is unlikely to shift; the club’s bet in not dismissing the Dutchman is that his prosaic team will acquire sufficient points to make the top four. There are few guarantees, of course. Nor, it seems, pressure on the Dutchman. Indeed, the club was at pains this week to deny that representatives had met with Pep Guardiola in Paris – a line of gossip seen, by some, as a move for the much-coveted Spaniard. Despite United’s dire pre-Christmas form, club insiders insist that the “genius” Dutchman’s job is safe. United, goes the briefing, is “not a sacking club,” but one that values the kind of longevity Guardiola would never bring. The dichotomy of that view set against the appointment of a 62-year-old soon-to-be retiree is lost of few supporters. The Dutchman has certainly been fortunate that his team found just enough resilience to secure two Premier League victories this month – six points that keep United in touch with Tottenham Hotspur in the race for fourth place. Games against the north Londoners, City, Chelsea, West Ham United and Leicester City are still to come this season, although United’s fate is more likely to be sealed in matches against the kind of modest opposition that Van Gaal’s team still finds difficult to break down, despite Wayne Rooney’s return to goalscoring form. Like United, this weekend’s opposition, Southampton, resists easy analysis. Neither challenging for European places, nor likely to be sucked into a relegation battle, Ronald Koeman’s outfit has struggled to find consistency this season. Stripped of £125 million worth of talent over the past two seasons, Southampton has at least managed a period of consolidation under the Dutchman this season. It is a place from where to build after the firesale of talent to United, Liverpool and others. Indeed, Southampton remains a case study in club management that could have gone south but for Koeman’s steadying hand in the wake of Mauricio Pochettino’s departure and changes at the executive level. On-the-pitch, Koeman’s team enjoyed a fine 3-0 victory over West Bromwich Albion last weekend, but has also suffered reverses to Norwich City and Crystal Palace since the New Year. Plus ça change for the campaign. Koeman’s side has scored more than just six sides in the league this season, although it is a record built on positive results at St. Mary’s. On the road Koeman’s side has struggled – a symptom of Graziano Pelle misfiring, Sadio Mané being far less consistent than a £30 million price tag might otherwise suggest, and Shane Long’s career-long profligacy in front of goal. Despite the poor record away from home Koeman remains confident that his side can repeat the team’s victory at Old Trafford last season, although United won an atypical high-scoring game at St. Mary’s earlier in the campaign. “I don’t talk too much about Manchester United because everybody is talking about Manchester United, and they had a big result last weekend,” said Koeman. On the touchline Koeman and Van Gaal will embrace, as has become the much-debated acceptable norm, but there remains little in the way of warmth between the countrymen. The pair clashed during Van Gaal’s second spell at Ajax – the elder man in the ‘Director of Football’ role many observers believe is required at Old Trafford; Koeman the freshman coach with an unbending will. Never a good match. 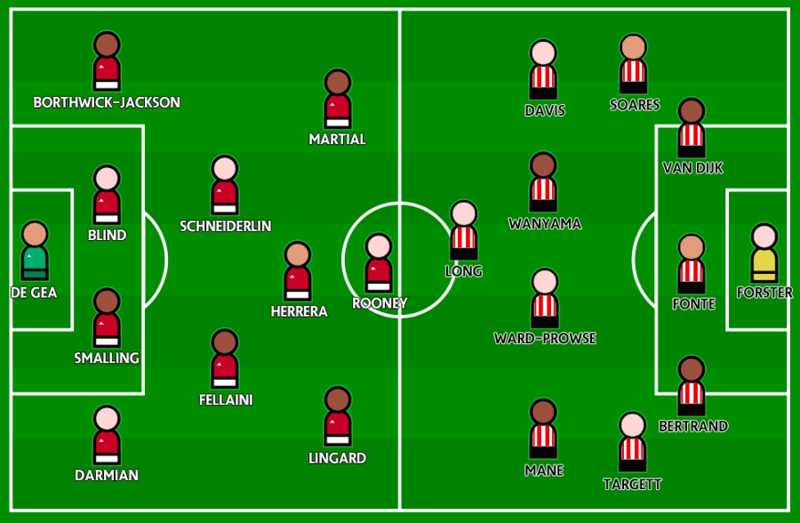 Whether United’s profligacy in front of goal will match well with Southampton’s probable back-five is a key question. United created just seven chances against Liverpool last weekend, scoring with the side’s only shot on target – Rooney’s volley into the roof of the net with 15 minutes to play. Van Gaal needs more of that ilk if the gains of the past week are not to be quickly eroded. He can hardly afford it if that more relaxed demeanor is to continue into the spring. “Bad luck,” insists Van Gaal, is at the forefront of United’s latest defensive injury crisis, with Ashley Young joining, Phil Jones, Marcos Rojo and Luke Shaw on the sidelines. The Englishman is likely to be out for “a long time” with a groin injury sustained against Liverpool last weekend and described as “severe” by his manager. It brings to seven the total number of United players on the sidelines. With injuries come opportunities, of course, and Young’s injury means that one of Cameron Borthwick-Jackson or Guillermo Varela is likely to be drafted into a back four that has rarely been blessed with a consistency of personnel this season. “I have used youngsters a lot of times and they are doing great but the level of Man United is high and to give a high performance every week is very difficult for the youngsters,” added Van Gaal. Matteo Darmian’s improved performances may have lessened the acute search for a right-back, although his manager confirmed this week that United’s primary winter transfer targets are full-backs. Certainly, with Shaw out for the long-term, and Darmian’s form inconsistent, Van Gaal’s team has rarely been able to attack from full-back this season. Michael Carrick’s continued absence with a knee injury leaves Van Gaal with a dilemma – whether to retain Marouane Fellaini in a deep-lying midfield role. The giant Belgian was badly exposed in a defensive midfield position in matches against Newcastle and Liverpool over the past fortnight. In wide areas Jesse Lingard is likely to continue in the role he started against Liverpool, leaving Juan Mata once again relegated to the bench for Southampton’s visit. Lingard’s pace adds penetration to United’s attack, although it comes at the expense of the Spaniard’s midfield control. Indeed, with Herrera pushed into a more forward role, Fellaini in central midfield, and Bastian Scheweinsteiger still out, United enjoyed just 42 per cent possession at Anfield – a season low. Meanwhile, the visitors have added £4 million striker Charlie Austin to the squad after the player’s move from QPR this week. Austin vies for a start with Long, while Pelle is doubtful after suffering ongoing knee problems and Jay Rodriguez remains out. Valdes? Thouhgt he is already sold to standard liege. Iike to see Varela given another chance at RB. Prediction: draw. About your predicted team today (you are probably right btw) we look very weak down the left defensively. Koeman will look to exploit that I suspect. On the opposite flank, Lingard does at least try to track back with a greater degree of effort. Depay is sadly lacking in his defensive application, he has the look of someone who thinks “this isn’t my job, you know…” IMO. At least we have some pace with Depay and Lingard . Van Gaal has to go now, no further discussion !!! Louis van Gaal. Thanks, but no thanks. This is the end of the road. Giggs can do no worse. And can we sign a striker please? I like the rejigged website. Very nice indeed. Also, thanks for the continued excellence of the articles and podcast. If I was a rich man, I would invest heavily but as I’m not, I’ll throw a few quid in the tips jar when I get paid.